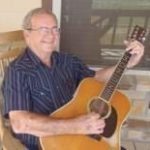 Joe Franklin Bass, 86, of Lipan, passed away on Sunday, April 7, 2019. Service: 10:00 AM, Thursday, April 11, 2019, First Baptist Church, Lipan, Interment: Evergreen Cemetery, Lipan, Visitation; 6:00 PM -8:00 PM, Wednesday, April 10, 2019, First Baptist Church, Lipan. Joe was born on September 20, 1932 in Ivan, Louisiana to James and Hattie Bass. He proudly served in the United States Army during the Korean War. He married Barbara Arthur on November 7, 1953 in Palo Pinto County, Texas. He played Bluegrass, Country, and Gospel music and was the lead singer for The Double Mountain Boys since their beginning in 1960. They played all over Texas including the first Mayfest in Fort Worth and made many friends along the way. He loved watching the Lipan Indians and the Lady Indians play basketball and he especially loved his family. He was a member of Lipan First Baptist Church. He was preceded in death by his parents, four brothers and four sisters. Joe is survived by his wife: Barbara Bass, children: Jo Ann Tarpley and husband Dwayne, David Bass and wife Shawnee, Jimmy Bass and wife Sharon, Danny Bass, and Karen Tuggle, seven grandchildren, 18 great-grandchildren, one great-great-grandchild, numerous nieces, nephews, and extended family and friends. We have friends for many years . I treasure the memories I have if Joe as well as his family. He has gained his wings and will be missed tremendously. Thank you Joe for being my friend. Sing on in Heaven.